The traditional method for laying utilities, eg water, gas and telephone lines, is to dig an open trench over the full length of the job and place the pipe in the trench in sections. The trenching operation causes considerable disruption and mess, and can be expensive. Road and pavement surfaces need to be broken up and reinstated using percussive tools. Workers are exposed to typical vibration magnitudes in the range 5 to 20 m/s2 for an average of 3 hours per day. Pipes for a new water main were laid without trenching across a motorway in northern England. The utility company hired a contractor who used directional drilling to lay the pipe. 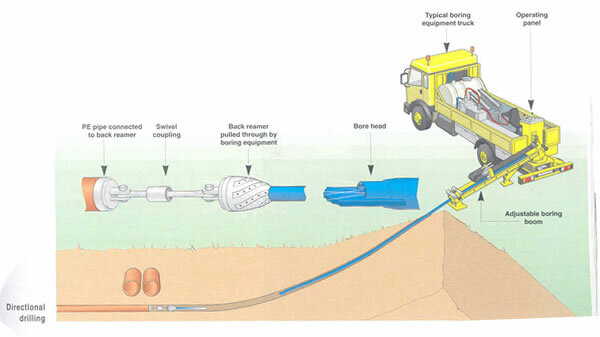 This technique, which can be used in areas with soft ground, involves digging a pit at each end of the pipe run and driving a steerable boring tool horizontally underground from one pit to the other. The head of the tool is steered from the surface using a mobile transmitter. After the boring is complete, the new pipe is pulled back through the hole. Small holes are dug from the surface down to the new pipe to connect the side branches to the main. There is a risk of disturbing other buried utilities, which can be avoided by following the HSE guidance book, HS(G)47, Avoiding danger from underground services. The total job costs about 75% of full trenching. Vibration exposure time is reduced from an average 3 hours to 15 minutes per day. This method is much quicker (about 25% of time for full trenching). There is less reinstatement and less disruption to road users and residents.